Motul Suzuki's Matt Moss completed his perfect season on Friday at Brisbane Entertainment Centre. Moss, who won the MX1 Australian Motocross Championship earlier in the year, clinched his second straight Penrite Australian SUpercross Championship after qualifying for the main. Moss went on to win the main event over Adam Monea and Sam Martin. In SX2, American Gavin Faith won his second career championship, his first since 2012, with his second place finish. Taylor Potter won the main event Friday ahead of Faith and Hayden Mellross. Fellow American Kyle Peters finished eighth on Friday. Team Motul Suzuki’s Matt Moss made it a perfect season in the 2014 Penrite Australian Supercross Championship to clinch back-to-back SX1 titles tonight at Brisbane Entertainment Centre. Moss, who earlier this year claimed a second MX1 title in succession outdoors, stormed from the back-half of the field in the 12-rider main event to take a defining victory. In one of the most dominant seasons on record, Moss sewed up the series earlier in the night by qualifying for the main event and gaining an unbeatable points advantage. “I want to say thanks to Brisbane fans for coming, but for me it’s been a great year and I can’t ask for any better – a clean-sweep,” Moss said. “This is a surreal feeling, I feel like I’m in the peak of my career and I want to go race in America to do Australia proud. Behind Moss was Adam Monea (NPS Monster Energy Kawasaki), who led the mid-stages before Moss made his way through, and sealed second in the championship after entering the weekend tied with Lawson Bopping (Team Motul Suzuki). Rounding out the podium was Victorian privateer Sam Martin (Suzuki) in what was his second-career SX1 podium following Phillip Island last season. He edged out early leader Daniel McCoy – who was a fast starter all evening on his private Yamaha – and teenager Jesse Dobson (KTM Motocross Racing Team). Another rider to run up front in the early laps was Josh Cachia (Husqvarna Motocross Racing Team), eventually finishing sixth, with Bopping, Kirk Gibbs (KTM Motocross Racing Team), Kade Mosig (DPH Motorsport Yamaha) and Robbie Marshall (Honda) rounding out the top 10. In the championship it was Moss who topped the podium over Monea and Bopping, who was battling for position until a mid-race mistake set him back down the order. In his final professional appearance Jay Marmont (Penrite Honda) had a night to forget, crashing before struggling to restart and eventually dropping out of the race. 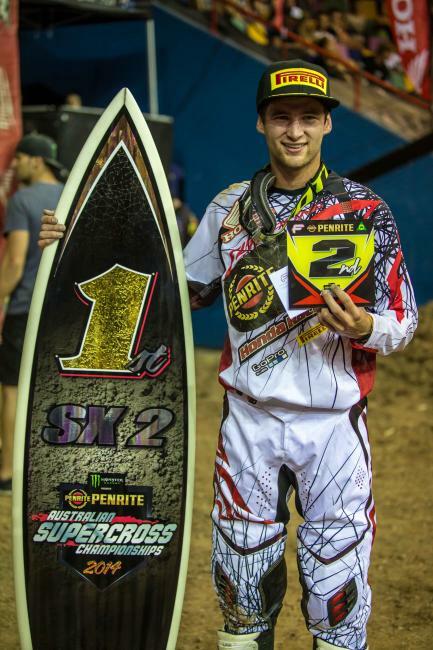 The SX2 championship went to American Gavin Faith, who added the 2014 title to his previous championship captured in 2012 for Penrite Honda. “I got out of shape a couple of times and went down on the first lap, but I’m super-pumped to wrap it up for Penrite Honda and for all the fans who came out tonight,” Faith commented. Faith led the opening lap but soon went down, which handed Ryan Marmont (Husqvarna Motocross Racing Team) the lead for the opening five laps before he went down shortly after, handing Taylor Potter (Boardstix Motorsport Honda) the lead in the process. From there Potter charged to an unchallenged victory, leading home Faith and Hayden Mellross (Raceline Suzuki), who made it two podiums in a row before he heads to the US for competition next week. Behind the podium it was Dylan Long (BBF Motorsport KTM) who charged to fourth, ahead of Geran Stapleton (Raceline Pirelli Suzuki). Marmont remounted for sixth in what could be his last fulltime outing, the field rounded out by Jackson Richardson (Honda), Kyle Peters (Wilson MX Honda), his teammate Luke Wilson and Kale Makeham (Tunetech Racing KTM). Brenden Harrison (Instant Security KTM) exited with a broken leg, while heat race pace-setter Luke Arbon (SD3 Husqvarna) – debuting a 250F – was also a non-finisher after he was forced over a berm in the early stages. Potter’s win saw him sneak past Peters for second in the championship behind Faith, making it a Honda sweep for the CRF250R this season. In the SXD category Dylan Wills (KTM Newcastle) put forward a flawless performance to clinch the overall and championship, winning the opening two races and then cruising to second in the final race of the season. Wills won the overall from Tom Ravenhorst (KTM), winner of the final race in another strong showing, while Aaron Tanti (Sutto’s/SS Racing KTM) completed the overall podium. Previous red plate holder Jack Simpson (Davey Motorsport KTM) had a disastrous night, falling victim to a number of first turn incidents in an untimely off-night and eventually ending up fifth overall for the round. Jordan Hill wrapped up the Junior Lites title for Yamaha Junior Racing with the overall from Kaleb Barham and Lachlan Barham. In the series it was Hill over Lachlan Holroyd and Travis Silk completing the top three.